Always one to get ahead of myself, Im thinking about extra seating in my dining room. Yes, thats right - I don't have much regular seating. Cart before horse and all that. To give you a bit of background: Before doing the reno, we worked the layout of our house to allow for a large table that seats 10-12 people. There isn't enough room to keep that many chairs and an extended table open comfortably all year - but the room is big enough to squeeze when the occasion calls for it. (Not that we often have 10 of our closest friends over for dinner but we do host Christmas dinner and hope to do at least one other big dinner party a year -we'll see if we ever get around to that). So this Christmas will be a hell of lot more comfortable than prior years where we crammed the whole family onto a too small folding table in our too small house. Just talking about having a table large enough to host a proper Christmas dinner this year is making me giddy with excitement! So back to my point - while the dining room table will have 6 chairs on a normal day, I need to have at least another 4-6 chairs at the ready for holidays. So that brings me back to the cart before horse topic. I can't yet find dining room chairs (or a table) that I like enough to buy right now but I would like to have some extra chairs so that visitors can sit down if I invite someone over for coffee. So I'm thinking of buying my "extra" guest chairs now while I hunt for the perfect everyday chairs. 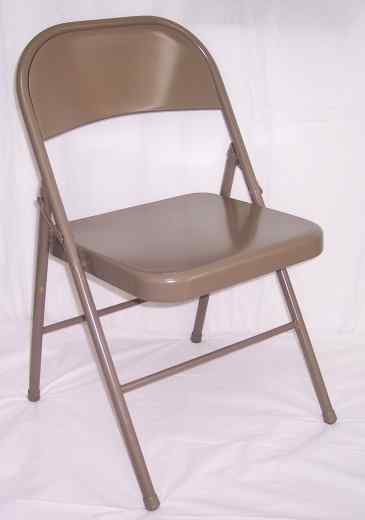 Ive looked around and found that Ballard Design has some really nice folding chair options. But at $100 a pop not including a cushion or shipping - thats a little rich for my blood. After all, these chairs will only see the light of day a few times a year once I get proper furniture. The rest of the year they will spent in the corner of the basement. They are stackable although not foldable (which would be more ideal if they weren't twice the price). The gold works nicely with the brass accents I have in the room. Plus the sight of Chiavari chairs always make me think of beautiful parties. So am I crazy? I don't want my house to look like a banquet hall but Im hoping a few of these mixed in with heavier wooden pieces will help create an eclectic look that works. FYI: In case you are wondering what sort of chairs Ive used to host prior Christmas dinners, take a look at this beauty. Although this photo doesn' t show the beautiful legs wrapped in duct tape or the dried paint dribbles. Those chiavari chairs are gorgeous. And I think you have it perfect--the amount of wood and metal that you have will balance each other out! Love your ideas! $130 for a set of two...free shipping...they're comfortable enough for folding chairs. I like the Chiavari option too. Glitzy! Those Chiavari chairs would do the trick in style! Great choice! LOL, we had the same chairs, the metal folding and when we look back we do not even remeber having them, but the fun we had outweighs, so as an FYI-the people make the party, not the chairs, that said, those are certainly a great price, and would work anywhere. True that people make the party but I like things to look nice :) Also, those metal chairs make gouges in the floors.